Ever gone camping in the desert? If it’s on your list of things to do in the UAE, now is the perfect time to check it off. Round up your adventure buddies, drive into the dunes, set up your tents and enjoy a night under the stars. Alternatively, if you fancy something more luxurious, you can sign up for the 5-star glamping experience! Ready to jump off a plane? Dubai is one of the most iconic places in the world to go skydiving, and what could be cooler than flying over a man-made island shaped like a palm tree? Definitely an experience to tick off your bucket lists! Looking for an awesome sky-high experience to try in the UAE? Sign up for an early-morning hot air ballooning trip in the desert and watch the sun rise above the desert dunes. Yep, it’s as magical as it sounds. Did you know you could skate on top of the UAE’s tallest mountain?! 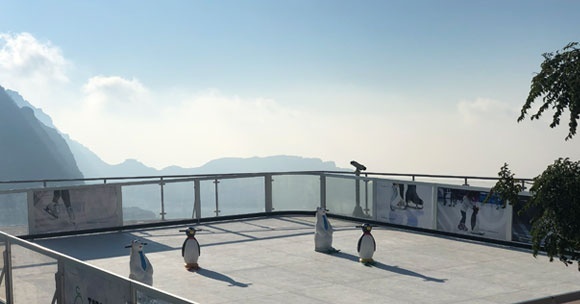 The viewing deck at Jebel Jais has transformed into an ice rink for winter, and with temperatures dropping this weekend, it is quite literally the coolest place to go ice skating in the UAE right now. If you haven’t been to Hatta Dam yet, what are you waiting for?! Whether you want to kayak, ride a pedal boat, chill in a donut, or just enjoy the mountain views, this place is a must-visit for everyone in the UAE. It does get a bit busy on weekends, but head there early to skip the queues. Fancy watching the sunrise from the top of a mountain, overlooking the city? Round up your mates and get ready for a road trip to Al Ain’s Jebel Hafeet mountain. The views from the summit are incredible, especially at the crack of dawn. Adrenaline junkies, this one’s for you – especially if you love watersports! Get ready to channel your inner superhero and sign up for a flyboarding session. Using water jets strapped to your feet, you’ll be pushed up into the air and flying over the water in no time. Yes, you can actually go white water rafting in the UAE! Get your adventure-loving friends together and make your way to Wadi Adventure in Al Ain. They’ve also got surfing, wakeboarding, giant swings, ziplines and more! Daredevils, are you ready for the ultimate thrill ride? You need to try out the XLine Dubai Marina zipline! You’ll be hanging 170 metres over Dubai Marina, before flying down Superman-style at speeds of up to 80km/hr! Get your partner in crime to sign up too! Fancy swimming with turtles? Fujairah is filled with some of the UAE’s best marine life! Whether you’ve got an open-water diving license or you just want to snorkel, head to Dibba or Sandy Beach to explore the waters.